Do you feel like your gaming desk is lacking something? If you’re an avid gamer, your desk is more than just a place to sit. Whether it’s comfort, design, or another issue, you can improve your gaming experience by upgrading to a better gaming desk. In fact, desk design is important to the quality of your gaming experience. Just like a work desk, your gaming desk says a lot about you. An old, cluttered desk limits your ability to relax and focus. A desk that’s too high or too low can mess with your posture, causing long-term problems. Some of these issues can be solved by changing to a different chair. But the right desk can provide the perfect foundation for an amazing gaming experience. Once you have the desk, it’s easy to pair it with a comfortable gaming chair. Make your space work for you with one of these highly recommended, unique gaming desks. We’ve selected 8 of the best ones you can find and order on Amazon. What makes these desks so amazing? Read on and find out! This desk has a clean, simple design that uses space efficiently with no frills. Made of tempered safety glass with beveled edges, this is a modern look that fits well with a minimalist design. There are no extra drawers or shelves, so there’s no room for clutter to accumulate. Although the desk may look delicate, it has a sturdy steel frame that will hold up to years of use. With over 4,000 customer reviews on Amazon, this desk has been tried and loved many times. Features include a sliding keyboard tray and CPU stand. This desk is designed to fit nicely in a corner, perfect for gaming rooms with slight space constraints. This charcoal-colored desk is great for small spaces. Although small, this desk is carefully organized to keep all your equipment and necessities in easy reach. The cross-leg design in black steel gives it a modern, efficient look. With an elevated shelf that fits a monitor of up to 32 inches, this desk allows you to work with your laptop and monitor at the same time. A front-facing, curved desktop provides comfort for long gaming sessions. It has space to store your laptop, 2 controllers, 2 speakers, 10 games, 1 headphone and yes, even a large drink. A wire storage drawer holds pens, paper, and other small items. This desk is incredibly efficient, perfect for the well-organized gamer. Add a touch of glamor to your gaming with this attractive glass desk. The L shape is perfect for placement in a corner. Curved legs with a black powder coat finish add an aesthetically pleasing touch. The glass is sturdy and carefully packaged so it will arrive safely to your home. This desk is beautiful, unique, and provides a lot of surface space to work with. There is a desk shelf and slide-out keyboard tray to maximize use of space. If you have a reasonably large corner space for your desk and want an eye-catching modern design, this desk is an ideal choice. This small stand maximizes vertical space. It makes a great addition to an existing gaming desk that doesn’t quite have enough room. The design is as much function as it is formed, created to hold as much equipment as possible. This is a great choice if you need to make small spaces do more work. Organize your games, accessories, and consoles easily with this stand that also supports a 37-inch TV monitor. It holds up to 12 games, 3 consoles, 4 controllers, and 1 headphone. There’s even hanging space for guitar controllers. The small footprint of this storage stand means it fits well into many tight spaces. If keeping your gaming desk organized has become a struggle, this stand will provide what you need without having to buy a whole new desk. Developing by a Swedish design team, this desk marries form and function, with 14 square feet of solid surface with a custom mousepad. Choose from 5 colors: red, blue, green, white, or black, to fit your preference. At a width of just over 5 feet, you can use up to 3 large monitors on this desk. Although large, the surface is stable, with a firm base. It can also be adjusted to different heights to maximize your gaming comfort. A water-resistant, machine-washable custom mousepad with a non-slip underside sticks to the surface without moving, giving you a massive field of play. At 5 millimeters thick, this mousepad is as comfortable as it is functional. This simple table-style desk works well in many environments. The architectural, black metal design is simple but attractive. The sleek look won’t overwhelm a room, but adds a touch of functional style. This desk is great for a small home office or dorm room, where large furniture may not fit well. It’s both lightweight and durable, so if you move often, this desk is a good pick. The BHG Gaming Desk Table can hold up to 2 monitors with room to spare. If you want a simple design to hold all your equipment, this desk does the job. It’s sleek, but sturdy enough for everything you need. The desk also includes a headphone holder and is easy to assemble by yourself. This unique desk converts to save space. The futuristic design can be shaped in many ways, depending on your needs at any given moment. Tubular steel makes it durable, yet lightweight. This expandable desk provides many options. The open design has features including a pull-out keyboard shelf and a bottom storage shelf, with clearance for a tower, printer, or other storage. The main shelf can be pulled out to change the desk into an L shape, adding more workspace when you need it. If you need to spread out sometimes and consolidate space at other times, this desk is your best bet. This is a great desk if you often move your gaming space between rooms. It’s also ideal if your gaming room has more than one purpose, so you can spread out while gaming and then collapse the desk to make more space for other activities. This desk has a sturdy, solid look. It gives a nice balance between classic and modern design. You can easily access and conceal wires using the desktop and leg grommets. The hefty inch-thick desk surface is scratch- and stain-resistant and edge banding helps prevent dents and nicks. This 60-inch desk is great for high-traffic areas, since it is sturdy and designed to protect from potential damage. It comes with levelers for uneven floors and has an open design that maximizes leg room underneath. You can customize your workspace on this desk by adding a keyboard tray (or pencil drawer). This stable desk works nicely if you have a large, permanent gaming space and are looking for a comfortable, well-crafted desk to fill it. With a 10-year warranty, this desk is great if you want something that will hold up well in the long term. It’s said that what’s on your desk says a lot about you. The desk itself also says a lot about you. There’s no right or wrong desk: it just depends on your needs. 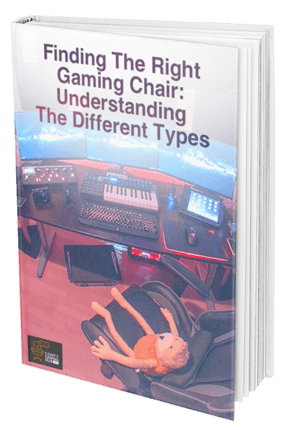 Choosing the right gaming desk for you depending on multiple factors. You’ll need to consider how much space you have to work with. Are you thinking of putting this desk in a corner or against a wall? Are you in a dorm room or a house? You’ll also want to think about how often you’ll move the desk. If a move or remodel is in your future, one of the lighter, simpler designs will be best for you. If you are keeping the same gaming space for the foreseeable future, try a heftier desk with your favorite features. Make sure you’ll have enough storage space for all the equipment you need. If you typically work with 2 or 3 monitors, take that into consideration. Think about where your towers might go. Will you be using a laptop as well as a monitor? 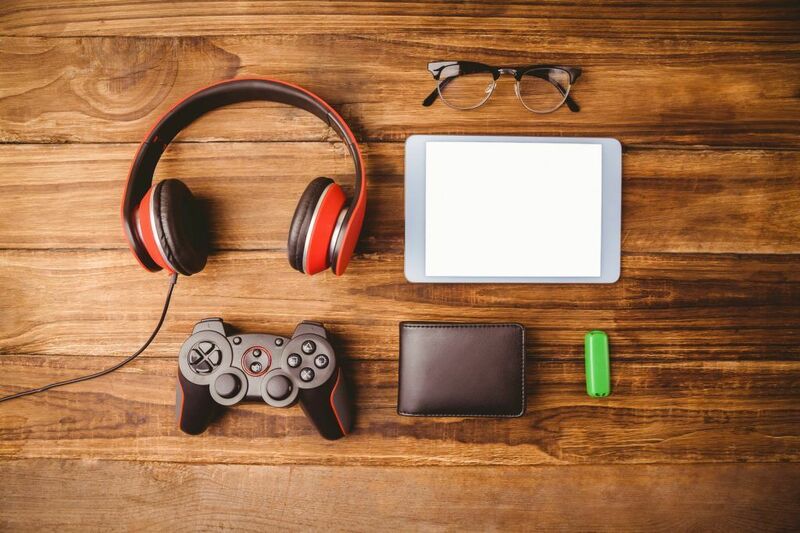 What else needs to go on your gaming desk? Some desks have built-in storage for games, controllers, and consoles, while others work best when paired with other furniture to maximize storage. And don’t forget visual design. You’ll be looking at this desk often, if not every day. Pick something that looks good to you, and that feels good as well. Do you want to be touching a smooth laminate surface, or maybe a soft custom mousepad, while you’re gaming? Choose something that’s comfortable for you. There are many options out there, but the unique, highly rated designs we’ve featured are among the best. When your desk is organized, customized, and comfortable, you can give your full attention to gaming. The right desk is the foundation for your best gaming experience.